An unusual and powerful tenor saxophone quartet profoundly stunned Seattle during the Earshot Jazz Festival of 2014. The complex foursome of Battle Trance reappears in the Pacific Northwest after two years of touring and a sophomore album release, kicking off Earshot Jazz’s winter series, Sound In Motion: Bright Moments for Dark Nights. Performing their unique meld of avant-jazz, classical, and even metal-infused soundscapes, the quartet will play on January 27 at Chapel Performance Space at 8pm. The origin story for Battle Trance is one of obeying an insistent inclination. 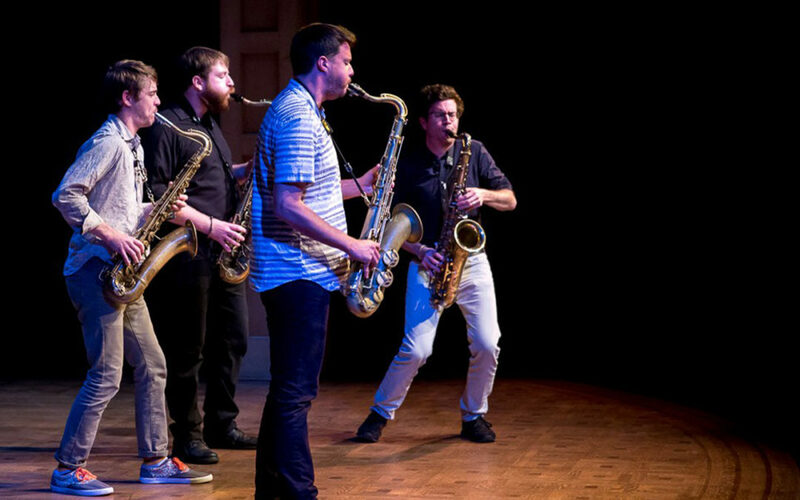 In 2012, Vermont/Brooklyn hornsmith Travis Laplante followed a mysterious feeling to get in touch with three wildly talented near-strangers – Patrick Breiner, Matt Nelson, and Jeremy Viner – to piece together an experimental saxophone band. The project launched with an exploration of circular breathing and a sonic connection surrounding the four players. Since, it has been the platform for two records and highly anticipated international concerts. Like its predecessor, Blade of Love is a three-movement extended composition, and begins immediately capturing a few of the idiosyncratic techniques for which Battle Trance is recognized. Between sound walls of sustained blasts and cooed chants imitative of Gregorian polyphony, the quartet employs aggressively fast runs and unorthodox articulation to create hypnotic waves with a forceful emotional clarity. Following in the footsteps of groundbreaking idiosyncratic saxophonists Evan Parker, Albert Ayler, Peter Brötzmann, Roscoe Mitchell, and John Butcher, Laplante and the band explore multiphonics and singing into their instruments while exhaling to result in shifted vocal timbres. Laplante explains that by integrating non-traditional methods, his instrument is allowed to act as a resonant chamber to imitate sounds, such as arrows flying through the air, singing in church, running water, and the sound of rage, that he had envisioned for Blade of Love. Welch’s duo and the sax quartet were paired earlier this month for a notable show in New York, Battle Trance’s current base. Welch says he has been an advocate for the quartet since their formation and describes himself as a big fan. Welch adds he finds it important to note that Battle Trance has chosen an acoustic means of applying these techniques as opposed to using amplified sources. “This gives a very meaningful, humanizing element to their work and helps to pull out textures only possible in acoustic resonance,” he says. Social consciousness and spirituality are the bedrock aesthetic values of Battle Trance’s identity. These compelling guys have led a single instrument into a landmine of innovative ambition, masterful and primal and begging to be experienced. Tickets & information available at earshot.org.